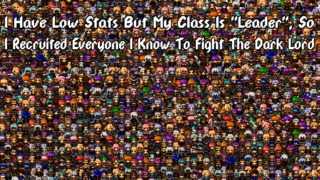 A comedic RPG where the player controls 99 characters. The game starts with the introduction to the main character, Josephine. While she's supposed to leave home to fight the Dark Lord, she is not skilled at fighting and ends up convincing the entire starting town to follow her in her quest.